(1) I’ll start this one with a reference to a new paper and a flashback to one of my own essays. 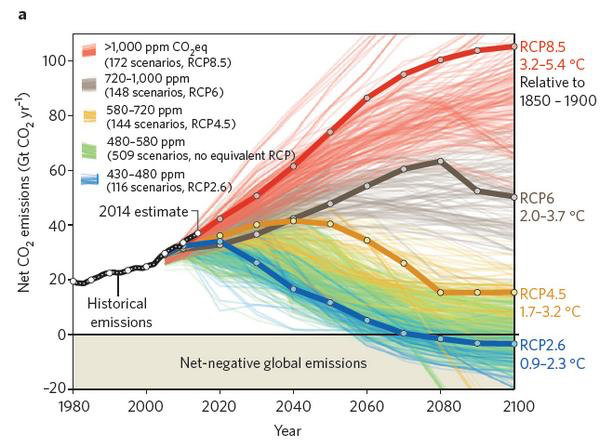 The IPCC developed a concept for its last report called ‘Representative Concentration Pathways’ (RCP), which are scenarios about what might happen given certain assumptions about the control of carbon dioxide. The scariest of these is RCP 8.5, which is, not coincidentally, the most favoured pathway if you are an alarmist writer. I wrote about it here. RCP 8.5 is not, as often claimed, a ‘business as usual’ scenario, but a highly unlikely scenario requiring people like businessmen to behave irrationally. However, you just have to chip away, as I am doing here. 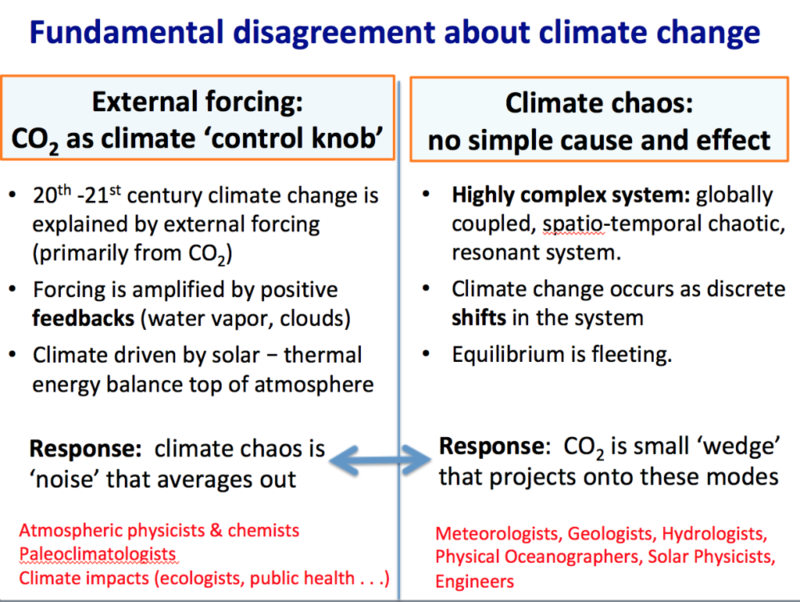 (2) Judith Curry is asking those interested in the debate about climate change to help her with the slide that follows. It’s a bit cryptic for me, too. (3) I started this website six years in mid June. In the last June-to-May year it received 113,658 hits. There have been 873 posts and 20,627 comments in the six-year period, and somewhat fewer than 4,000 comments in the last year. If we take out a hit for every comment, then last year the website received about 110,000 hits. That’s 110,000 ‘readers’, about 10,000 a month, given that December and January are only part months for the website. About three quarters of the readers are in Australia, the rest across the globe. I thank them all, and of course the commenters too. I must be close to a million words published on the website, which is about the same number that I published in newspapers over my working life. Doing the weekly essay is not a chore, but something I look forward to. I am never sure what the next one will be about, because there are always things happening that I feel the urge to comment about. Long may that urge continue! And Chinese co2 emissions have risen by 4% in the first quarter of 2018. Indeed Dr Hansen was correct when he said that Kyoto and Paris were just BS and fra-d.
Decades of wasted time and money since Kyoto and the same until 2100. Unbelievable but true. Here again are the facts about the Paris COP 21 BS and fra-d.
… and Tuvalu has still not sunk beneath the waves. Global May average for UAH steady at +0.18c. Australia -0.4c. Not surprised, it was b. cold for my annual camping trip. I would be interested to read your comments on the ANU’s rejection of the Ramsey program. It will be the subject of next week’s essay. Thanks, baz. Complete, of course, with the usual Con hypocrisy shining through. “Politicians and conservative academics have since questioned how ANU had been able to successfully negotiate donations with foreign entities but had been unable to resolve any issues preventing the Ramsay Centre ­alliance from going ahead. Mr Abbott this week pointed out the “hypocrisy” of the union opposing the course when the university had accepted funds from Dubai, Iran and Turkey in the past. A member of one of the donors, Dubai’s Al-Maktoum Foundation, is listed as a member of the centre’s advisory board. Are you suggesting that scenario 8.5 is unlikely? Every scenario has a likelihood of some sort. You need a lot more evidence before claiming RCP8.5 is “a highly unlikely scenario “. Such wanton vague comments are not useful. And yes, businesses will act economically rationally but ecologically irrationally. So even if the global economy doesn’t track RCP8.5, it looks more likely that we will track closer to RCP8.5 than RCP6 or RCP4.5. ‘Are you suggesting that scenario 8.5 is unlikely?’ Indeed so. ‘You need a lot more evidence before claiming RCP8.5 is “a highly unlikely scenario “.’ No, I don’t. If you read my previous essay, and go to the links and look for yourself, you’ll see that RCP 8.5 is quite unlikely. Read Kummer’s piece. Read Nordhaus. Then come back, if you are still of the same mind, and explain why. I do my own work. I’m not here to do yours. #the rates at which real per capita national GDPs are assumed to converge among the world’s countries over the next 100 years. The late, great Australian Statistician Ian Castles and the English economist David Henderson highlighted this in their critique of the IPCC’s original approach when it was still using the Special Report on Emissions Scenarios (SRES) back in the late 90s. While the particular Castles/Henderson critique of the SRES approach turned out not to make a significant difference to the scenarios then in use, their input was very nastily received by the IPCC – the first sign to me that there was a lot more than science in play. Yes, I agree. I discussed the SRES with both Ian and David (at different times) some ten years ago. ,… and since Castles and Henderson wrote their Pollyanna arguments some ten years ago global temperature has continued to break record after record; 2014, 2015 & 2016. If Castles were around he could tell us the probability of pulling a record average temperature three years running. That feels like an 8.5 to me. Don you must be be living in a cave! Like Trump for example. Need I say more? David tell us your solution to your so called problem. And please your so called solution to your so called problem must at least pass the pub test. I’ve shown that their current mitigation strategy is absurd using actual data from the IEA, so what would you propose? Do try to keep up, davie. Scientific Technician/ Technologist	Possession of (a) theoretical knowledge of any of the following disciplines: agricultural sciences, astronomy, biology, chemistry, engineering, forestry, geology, geophysics, meteorology or physics; and (b) the ability to solve practical problems in any of those disciplines, or the ability to apply principles of any of those disciplines to basic or applied research. Ken Stewart checks out the Co2 temp driver theory and finds that like the ice cores SST actually responds before the rise in co2. IOW co2 is a follower not a driver of temperature change. That’s just another one of those inconvenient truths, Neville. When bureaucracies like the UK Met Office is right into telling lies like this, how can they be believed on anything? Guess when their warmest May really was? 1833!!!. They ignore the oldest temp record in the world. Chinese funding and support for Solar farms has plunged and it seems that Wind farms may suffer the same treatment. What a pity that OZ couldn’t follow their lead and stop funding clueless S&W energy and start building reliable coal fired plants again. Let’s leave aside the ‘computer projections’ and look at reality. The leaders of the Pacific Island nations have for tens of years now howled about their disappearing islands, and threatened legal action for compensation. How many of these nations have disappeared? None. How many of their populations have been displaced as ‘climate refugees’? One guy tried to get into New Zealand, and was rejected. Otherwise, none. Can we say the urgency seems a little forced? It is a useful reality for them. The trick is convincing those that might allocate resources. Western true believers are desperate for these island nations to be able to establish that they are sinking due to SLR/CAGW and would happily force compensation to be paid if they thought their lies could be substantiated. Their worst enemy is Charles Darwin, real world observation and science. Waal, as the sheriff says, these ‘records’ are the averages of averages of averages, and pretty-well meaningless, save to believers. David, time to read again about the use of statistics. What question are you asking for which an average of an average of an average is fine? Every time you average you lose information. Is the planet getting warmer? Of course! That’s one of the most common reasons for doing it. Averaging can be used to filter out the high frequency signals (thereby “losing information”) so you can focus on the long term trends. Don, you repeatedly tell us you think the planet is in a long term warming trend. How did you come to that conclusion without using averages of averages? Keep the faith, David, it’s all you have left! Well that is your reality but how useful is it? There are around 7 billion people and more than 150 nations. Do you find it useful thinking they can be changed and they will cooperate for what you think is the common good? I see nothing but failure in trying to do that. China for instance burns 48% of the world’s coal and it is rising. Totalitarian regimes in the past have been quite keen on environmentalism. Stalin’s Soviet Union and Hitler’s Germany for instance. Was the environment truly of concern or was it a useful way to control their populations? Regardless of your politics, planet is still getting warmer. David, you might recall that these ‘records’ were ‘records’ by mere tenths of a degree. I think money and publicity are quite rational. Is modern logic breathtaking or what? Just gotta give the Burka a chance! SD, so why doesn’t the Ramsay Centre take their offer of a course in Western Civilization to the Catholic University? Problem solved. All those young Tony Abbott wanabes could goose step around in their Union Jack underwear writing essays about the importance of the Magna Carta and the Crusades to civil society. I’ve been telling people for years to put their heads out the window and check for themselves on the SLR scam. The gatekeepers are now becoming tidekeepers. Conservatism, it’s not what former PM Tony Abbott is about. Do you really think Abbott could have possibly installed a truly conservative govt immediately, baz? “The culture wars are so out of hand that in retaliation for supporting the Ramsay Centre for Western Civilisation a university professor will ascribe views to me and The Australian’s foreign editor Greg Sheridan that we have never espoused and liken us to Anders Breivik — the Norwegian far-right terrorist who slaughtered 77 people — and the ABC will publish it. This is what passes for rational debate in our universities and the public broadcaster as they rail against any advocacy of traditional values and institutions, and any political opinion they perceive as being out of synch with green-left ideals. It is dire. This underscores perfectly why the goals of the Ramsay centre — to refocus our education and debate on to the inherent strengths of our liberal democratic heritage — must be embraced. If ever Paul Ramsay doubted the value and importance of his endowment, they would have been erased this week. PVO – Can Real Conservatives Stand Up – in the Weekend Australian. You and PVO make a likely pair, baz. At least bread-and-butter conservatives understand that you modern wishy-washies don’t know of what you speak. PVO’s POV is a joke for VOP with VPOs. Neoliberalism is the enemy. Add Barnaby Joyce. More Gray Connolly from 2014. If you watch The Drum, his latest appearance on a panel was most interesting. Yes baz, Abbotts greatest mistake was putting Malcolm in charge of Auntie. “The ABC has been caught out wrongly denying one of its producers had cancelled a Chinese human rights activist’s interview at short notice on the basis of her “affiliations”. She was scheduled to appear on Wednesday night’s edition of The World, but the ABC abruptly pulled the plug on the live interview after a week of preparations. Ms Lin’s representative was told that the decision had come from above and that there had been concerns about her “affiliations”. “Generators at five of the six NSW coal-fired power stations were hit by outages heading into the long weekend, stripping about a third of the state’s capacity and spiking spot prices to a forecast high of $14,000 in the early evening. Tomago chief executive Matt Howell said Australia was at a crisis point with its energy system because it was losing baseload generation needed for heavy industry. “The entire renewables industry is an act of faith. The ONLY reason it can survive is through subsidies. And those subsidies can ONLY continue if renewables true believers can persuade enough gullible people to accept being fleeced by their gullible governments to pay over the odds for wind and solar in the name of the environment. I’ve published an update on the website at the head of this thread. It was six years old this week.